US insurer Hanover’s bid for Lloyd’s insurer Chaucer still has a strong chance of success despite one key shareholder’s rejection of the bid. Last Wednesday, Chaucer’s board recommended that shareholders accept Hanover’s £313m all-cash offer for Chaucer, which comprises a main payment of 53.3p a share and a final dividend of 2.7p a share. The offer is 1.09 times Chaucer’s year-end 2010 net tangible assets. But shareholder Pamplona said on the day of the offer: “We believe the price is inadequate and have no current intention of accepting this offer.” A spokesman for Pamplona said the company maintains this stance and declined to comment further. Pamplona is Chaucer’s largest shareholder, with a 9.99% direct equity stake. It also owns derivatives equivalent to a 6.52% holding, bringing its total share of the Lloyd’s insurer to 16.51%. For the deal to go through, 75% of shareholders must back it. Chaucer has already received commitments to vote in favour of the offer from 21.28% of shareholders. Hanover has received a letter of intent of a favourable vote from Aberdeen Asset Management in relation to a 0.91% stake. Coupled with the directors’ acceptance, representing 1.4%, the deal has the acceptance of 23.59% of shareholders. However, Pamplona would arguably not have to work too hard to drum up support from the further 9% of shareholders that it would require to block the bid. 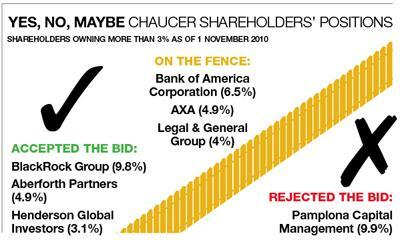 Some of Chaucer’s largest shareholders, including Bank of America (6.5%), AXA (4.9%) and Legal & General (4%) have yet to accept or reject the offer. Also, the price offers little premium either to Chaucer’s net tangible assets or current share price of between 55p and 56p. But there are a number of positives, in particular the all-cash offer. Espirito Santo analyst Joy Ferneyhough said it is difficult to see how another trade buyer or private equity firm would be able to offer more. “I do think 55p-56p is about right, particularly given that we are running into US wind season and there is still risk that the book value could deteriorate further from the current position,” she said. This isn't the first time, is it? There have been several attempts from rival Lloyd's insurers to buy Chaucer. Amlin had a stab in 2005. Both Brit and Novae made offers in 2009. Both Amlin and Novae said that they could not structure a deal that would be in the interests of shareholders. Would-be buyers' concerns are thought to have been centred on Chaucer's hedge fund investments, which it has subsequently shed. Who was in the running this time? Guy Hands' investment firm Terra Firma confirmed its interest, and news reports have named several other parties, including Canopius, a consortium of Goldman Sachs and private equity firm TPG, and former Ascot Underwriting chief executive Martin Reith. This will go. Under the timetable suggested in the announcement, the deal will complete in early July. Chaucer shares will then be delisted from the London Stock Exchange.